I'm hopeful that they will restructure their site layout to allow the eventual addition of the rail line spur. No reason why we can't have both, as both would be tremendous developments for the city. So, has the location of this parking garage just been moved to the south a little bit? Maybe the rail line can go behind it? I believe they are re-sizing the footprint to accommodate the rail line. I know this is still an active project. I also hope they move the south entrance to the parking garage (fronting Main) to the alley right next to it. That's a curb cut that can be avoided. Let's hope so. I heard the rail transit consultant that is now involved didn't seem to have a good grasp of all the rail transit plans for that area. I know I must be missing something here. 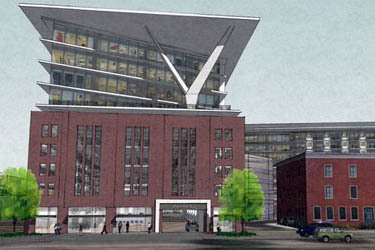 This parking garage was proposed at least a year or more ago. It just seems the simple answer would be to build it a little smaller or x number of feet from the track. Has it taken this long to come up with that solution? I like it, and it's needed. I park in that lot daily, and in the past month some new office must have come online because the front 2/3 of the lot is full by 7:45. A year ago, I could park near the front if I got to work at any point before 8:00. That lot is definitely approaching critical mass. Holiday Inn Express will also have a non-trivial impact on the parking there. Very true. And the throngs of families that will no doubt plan their family vacations around Brickopolis. Not as simple as "build x feet away from the track". It's important to protect a curved path from the north bound line to the east bound line to allow trains departing or arriving from Santa Fe Station can access the line going to Tulsa, NE side, and Midwest City. Also, I've heard Karchmer has decided to build another parking structure in Bricktown first; one the land he owns on the SW corner of Oklahoma and Sheridan. We should get definitely plans on that one soon, and then this project would follow. Just parking or might there be offices on top, retail on the bottom or both? Parking structure with retail on ground floor. Interesting. This would be the Karchmer #2 lot from the Bricktown Shakeup thread? As an aside, I hope the garage is designed well and aesthetically pleasing. When could we hear something official about it? It would first have to go through design review. I suspect the reason it got moved up on the priority list is due to the Andy Burnett purchases of the Karchmer properties ( Bricktown Shakeup ) to the east. Those properties should close this month and then the dominos will probably start to fall. My understanding is that a developer wants to construct a mid-rise hotel directly east (parcel 5 below) and this garage would serve that property and address parking needs in the middle of Bricktown. The garage depicted in this thread was primarily to serve the CBD, as Karchmer was looking to sell blocks of spaces to Continental and other downtown employers. 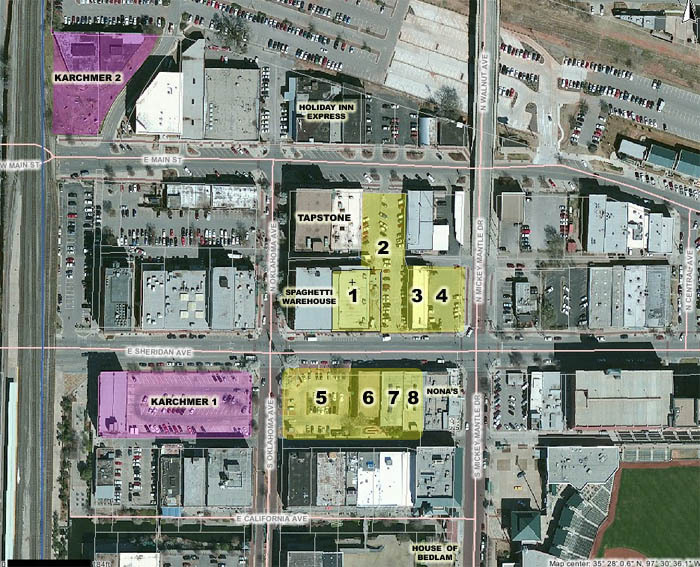 I know it didn't work on Main street, but to me this seems like a great location (Karchmer 2) to do ground floor retail and upper floor residential and/or office, given how hot the Bricktown office market has gotten of late. That is such a prime spot! I hope they do it right. Needs to be "family friendly" though. Pete, any word on what brand of hotel is being looked at for #5?